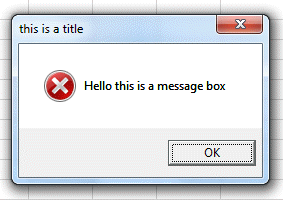 Using VBA you can create a message box informing the user of something or asking him to perform something. 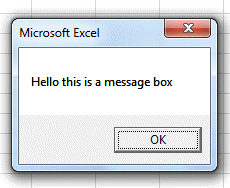 The Message Box is a dialog box create in Excel VBA and it looks like all the message boxes you have ever seen. For example here. MsgBox "Hello this is a message box"
A critical message can be create with the following code. A VBA critical message will include the critical logo. 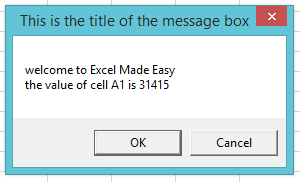 MsgBox "Hello this is a message box", vbCritical, "this is a title"
MsgBox "First Line" & vbNewLine & "Second Line"
A message displaying a value, for example the value of a cell like "A1"
MsgBox "welcome to Excel Made Easy" & vbNewLine & "the value of cell A1 is " & Range("A1"), vbOKCancel, "This is the title of the message box"
You can see we used the attribute vbOKCancel to tell him it must contain the 2 buttons OK and Cancel. The next part was the title or header of the message box. MsgBox "Do you want to marry me me", vbYesNoCancel + vbQuestions, "the big Question"
When working in Visual Basic Editor you will see how he provides you with the possible answers. Here there many configuration possible for the buttons configuration. Therefore you have to use the answer of the user. 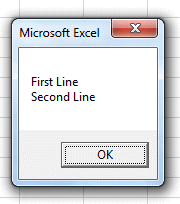 This can be done in VBA like the following code. 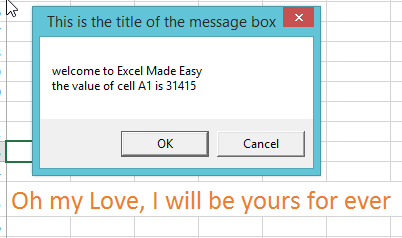 Range("a35").Value = "Oh my Love, I will be yours for ever"
Range("a35").Value = "Why, such a cruel world, you were the Love of my life"
This should give you enough to start programming message boxes in VBA by yourself. Good Luck.